Mortgages are loans that a mortgage lender or bank gives to help finance a home. There are three typical parts of a mortgage payment: principal, interest, and escrow. Principal is the amount of money you borrow to finance your home. Interest is the money paid regularly at a particular rate for the use of the loan. Escrow is a deposit included in a mortgage to pay property tax and homeowner’s insurance during the term of the mortgage. A qualification of an individual’s credit history that indicates that the borrower is a safe credit risk. A high credit score is an indicator of good credit, while a low credit score indicates bad credit. An individual’s credit history is dependent on a number of factors, including the amount borrowed, the amount of available credit remaining, and the timeliness of payments. 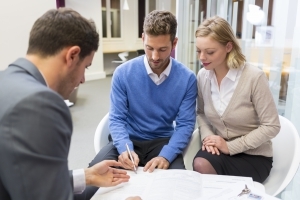 What Kind Of Mortgage Is The Best? This depends on what your plans are for the home you are purchasing. Fixed-rate mortgages get paid off over a set amount of time and at a specific interest rate. A 30-year fixed-rate mortgage is the most common example. As market rates rise and fall, your interest rate will remain the same. Adjustable-Rate Mortgages (ARMs) get a lower initial interest rate compared to a fixed-rate mortgage. Interest rates fluctuate depending on market conditions. Federal Housing Administration (FHA) loans are mortgages insured by the Federal Housing Administration. They are designed partly for borrowers who cannot come up with a large down payment or have poor credit. This is a popular choice for first-time home buyers. Veterans Administration (VA) loans are a zero-down loan offered to qualifying veterans, active military, and military families. In most cases, no down payment is required and you will not have to pay mortgage insurance. If you qualify for a VA loan this could be a great option for you to explore. SONYMA loans (State of New York Mortgage Agency) are an option for first-time home buyers in New York who make less than $100,000 per year. If you qualify, this program provides for loans with only 3% down payment. A Conforming loan is any home loan that follows Fannie Mae and Freddie Mac’s conforming guidelines, which include credit, income, asset requirements, and loan amount not to exceed $424,100. Jumbo loans are referred to as non-conforming mortgages. This is a good option when you are purchasing a higher-priced home. The rate on this type of loan can be between a 1/4 to 2 percentage points higher than on a Conforming loan, making qualifying for a Jumbo loan more difficult.